This is a beautiful shoe, but unlike many other Think! 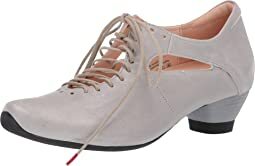 shoes I've purchased, it doesn't have that form-fit to it. The strapping all the way around felt much too loose. Even going down a size smaller than I usually wear would have left my foot flopping around in this. I do have thin feet, but pricier, well-made shoes like this usually tend to fit me. Big disappointment to have to send these back. Too small. 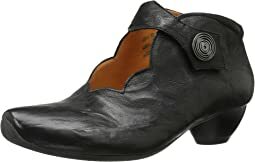 The THINK website lists the european size 43 as a US 12/12.5. Zappos lists as US 13. I wear a true 13 & these were too small. So disappointed because one of my favorite pair of sandals was a THINK brand years ago. Fit like a glove straight out of the box. Lovely soft leather. I get severe contact dermatitis from chromium. This Think! 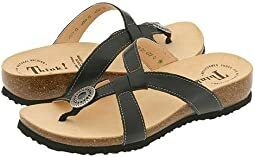 Sandal is made from vegetable tanned leather (free from chromium) and I am excited to be able to wear sandals again. I have big wide feet (11 W) and the 43 M fit me beautifully. I have 2 pairs of this style. They are very comfortable and have lasted years. I highly recommend them. If your feet are narrow, these probably won’t work for you. I have a wider than normal forefoot and these are plenty roomy. Super comfortable and they look amazing on. I got these in rum which is a warm brown and might try the pink (puder). I wear a 40 in dansko, 41 in this brand. Worth every penny. Hope the Velcro holds up. 4 stars for comfort because I have lost fat in the bottom of my feet. Perfect fit and size and I think I will wear them Every Other Day! Perfect fit and size and I think I will be wearing them EVERY DAY in the summer. Perfect fit and size and I think I will wear them ALWAYS in the summer to come! Well first of all they’re really cute and I thought I was going to have to give up on cuteness. This was my 5th try to find shoes to keep my feet comfortable on two European trips I have planned for this spring and fall, both requiring lots of walking. My feet are old! (OK, so the rest of me is too but I’m fighting it.) I have plantar fasciitis and small bunions. My feet are wide — I need a wide toe box but my heel isn’t so wide. 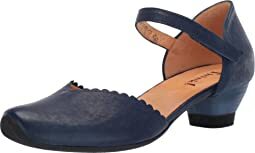 The several pairs of flats I tried all were too tight around the bunion area and too loose in the heel. These shoes have solved my problem. The recommended size was too big though, so one more return and now I’m set. I generally wear a 7 and the 37 fits fine. The Velcro strap means I can comfortably wear them with and without socks. Thank you, Zappo’s, for your easy return policy. Design problem the part between the toes is too stiff and very uncomfortable. This is the original Think style I bought and loved 10 years ago! At some point, the shoe changed, became too narrow for my feet, and cut into me. This looks and feels like the old style. Great shoe to wear casually and dressy. These were not at all what I expected when I received them. There is no padding in the ball or heel of the shoe. I have very sensitive feet & need the padding. The other reviews did not help in any way! They have to go back! These shoes feel divine. The leather is amazing inside and out. The naturally shaped footbed fits my wide foot very well, but still looks cute. I would t recommend these if your have narrow feet, but if you have a medium to wide forefoot these will work well. Heaven on my feet! I have a wider forefoot and regular heel, so it’s super hard to find shoes that fit. However, I have found that I can usually wear regular width shoes when they are designed to fit the actual shape of real feet. 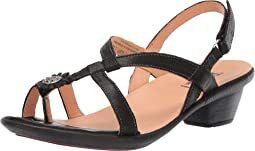 These shoes are spot on, and they have Incredibly soft leather inners and cute detailing in the straps. These are my Goldilocks shoes. I Can’t wait to try more from Think. Note: This shoe style would work great if you have regular to wide feet, but probably not for someone with very narrow feet. These are very nice shoes -- well made and cute. But they have no arch support. And I felt that the laces might dig into my foot when I wore them without socks. Had to return. The first pair , a nine , was too big. The eight fits better. I’m not sure how comfortable they are. The jury is out on that. Purchased these to replace my Think mules of nearly 9 years. The soles ofmy new red ones are a good bit lighter than my other pair but still sturdy. I love the broad toebox. Stylish and confortable. Can't wait til summer when I can wear them without socks. These shoes are dreamy! 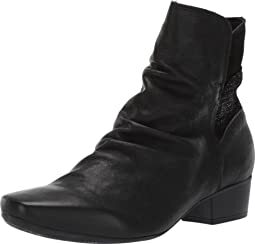 I have a slightly wider foot and high instep and these fit and look great. I got the red which is pretty but am reconsidering getting black (boring!) instead. 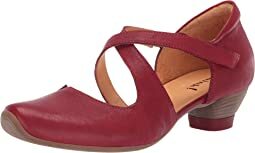 I loved the shoes and would have gladly paid the price asked BUT I have a very narrow heel and these slipped as I walked. That was not going to work for me. In future I will need to find either clogs, slides or sling backs. They are truly a beautifully made shoe and super quality so I am returning them, sadly. These shoes feel great, like they were made for me. Very comfortable and cute style.